There are three measurements in the table below; Width (across the chest armpit to armpit), Length (shoulder to hem) and a traditional chest measurement in inches all the way around. Up against the Gap classic crew neck short sleeve t shirt our men’s t shirt is about 2cm longer across every size but very close in terms of width. 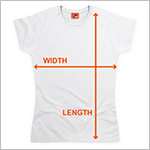 There are three measurements in the table below; Width (across the chest armpit to armpit), Length (shoulder to hem) and a traditional chest size as a guide. Please bear in mind that our women’s shirts are a slim-fit, stretch cotton garment. If you prefer to wear a shirt with a looser feel, we recommend choosing one of our men’s shirts. For size 10-12 we recommend a small, 12-14 a medium, 14-16 a large and 16-18 an XL. They come in the same premium pre-shrunk cotton jersey with taped neck and shoulders, but will offer you more of a classic t shirt fit. 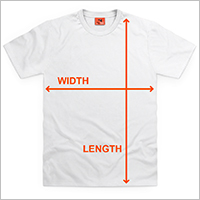 Please scroll up to see the measurements of our men’s T shirts.